The Fijian term that referred to eight nights (and days) of strong trade winds, as depicted by the weather pattern isobar graphic on the right..
Bogi (night) walu (eight), also known as aho valo in Tonga, refers to the period when there is a surge in the South East trade winds over the Fiji Group. The synoptic weather situation is depicted in the isobar (constant pressure lines) image above and results after the passage of a frontal zone that moves from the (South) West to the (North) East. Depending on the intensity of the sub-tropical high pressure (anti-cyclone) that develops to the South of Fiji, after the passage of the cold front, the winds range between 20 to 25 knots and on occasions with an intense anti-cyclone, can reach up to 30 knots. During my tenure with the National Weather Service in Nadi, this situation always called for the issuance of strong wind warnings for most Fiji waters. The winds, on occasions could last up to eight (walu) days if the anti-cyclone maintained its intensity and remained stationary to the south Fiji. As the weather systems that are responsible for the bogi walu continue moving eastwards, the trades usually subside after four to five days, and re-surge when the after next frontal band traverses the group. This pattern is most prevalent during the cool season when the 'cold cored' systems passing through Fiji are most frequent. The author of this site, graduated in physics with a concentration in atmospheric physics, from the University of Auckland. This was followed by an year of graduate studies in meteorology with the New Zealand Meteorological Service and at Victoria University of Wellington.Upon completion of the graduate studies, the first assignment was with the Fiji National Weather Service, at the RSMC in Nadi. The Nadi engagement instilled a desire to develop software engineering skills as a means to computer modeling of the atmosphere. This led to a career change and a move to the Fiji Govt. Computer Center and the University of the South Pacific Computing Center, in different roles from software engineer, lecturer in operating systems and programming, to acting director of computing services. 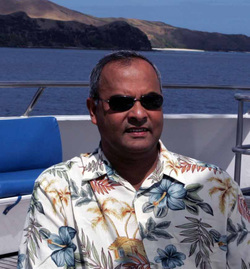 During this period Peter together with a small group of pioneering individuals formed the the Fiji Computer Society, where he served as the first secretary of the society until his departure to the United States. The move to California provided further opportunity to engage directly in computational meteorology. The early years in the San Francisco Bay Area involved further graduate studies in atmospheric sciences, that eventually led to a six month internship with NASA's Space Sciences Division at Ames Research Center. During this period the focus was on enhancing NASA's planetary boundary layer (PBL) model to more accurately represent the diffusion of energy in the atmosphere. The primary computers used for these modeling experiments consisted of OpenVMS front-end systems for software development coupled to CRAY X-MP supercomputers for model execution. This PBL model was used by the Space Sciences Division to model the atmospheres of planets including Mars, which was very topical in space research at the time. Also of interest was the study of ozone depletion and during this period of internship the first international conference on ozone depletion was hosted at the Space Sciences Center. Many a debates on chemical depletion as opposed to dynamic transport, were witnessed firsthand. After a few years of mainstream business computing Peter rejoined the software engineering team at Ames as a senior software specialist. This role entailed the development of software for real-time acquisition and analysis of wind tunnel systems data, that is generated while running tests for the aviation industry. One of the highlights of this period was the development of software for wind tunnel testing of thermal heat tiles for the space shuttle program. After a 20 year period of computing in the financial services industries, including the development of online trading engines, Peter is consulting in the aviation field, with General Electric's Software Center of Excellence Computing Labs. He remains an active member of the IEEE Computer Society and the American Meteorological Society.